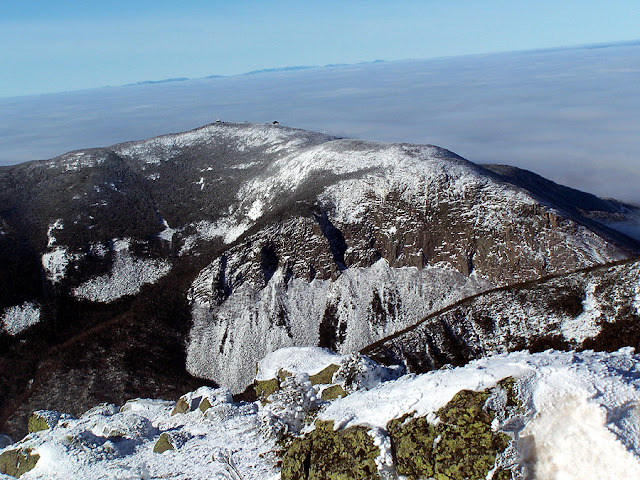 Cannon Mountain is the northern most 4,000 foot peak on the west side of Franconia Notch. The summit is wooded but there is a outlook tower where you can enjoy 360 degree views of the White Mountains. Cannon Mountain is a ski area and was home of the Old Man on the Mountain before it fell down in 2003. Kinsman Ridge Trail: 2.2 miles, elevation gain of 2,200 feet. The Kinsman Ridge Trail runs from the Cannon Mountain Tramway off I-93 (exit 34B) to the summit of Cannon Mountain. It is a steep and unforgiving trail with awful footing but is the shortest route to the summit. There are good views from of Echo Lake while hiking through the glades and even better views of Franconia Notch from on the final 0.5 miles to the summit. Hi-Cannon Trail / Kinsman Ridge Trail: 2.4 miles, elevation gain of 2,000 feet. The High Cannon Trail leaves the Lonesome Lake Trail and ascends up the steep eastern section of Cannon Mountain to the Kinsman Ridge Trail 0.4 miles south of the summit of Cannon Mountain. The trail has steep grades with poor footing over exposed roots, loose dirt, and rocks. There are a few outlooks along the way with great views down to Franconia Notch and Lonesome Lake. In icy conditions the trail has a few steep spots and an old ladder bridge that can become difficult to dangerous. Mittersill-Cannon Trail: 2.5 miles (2,200 feet elevation gained): As of the summer of 2013, there is a new alternative route to the summit of Cannon Mountain that heads up Mittersill Peak, located just north of Cannon Mountain. The trail starts at lot #1 at the far end of the Mittersill Chairlift. Unlike the other steep, rugged, in the woods approaches to Cannon Mountain, the Mittersill Trail provides a more pleasant and wide open views as it ascends up the ski slopes and utility roads. It is a calve-burner in spots up the slopes, but for the most part it's not too bad on the knees and legs, however, I do like ski slope hiking, where as many people do not. The trail climbs to Mittersill Peak with excellent views of Cannon's summit and Coppermine Cole in full view. Wide open views of Sugar Hill throughout the hike are quite nice, too. After Mittersill the trail drops to a small col and climbs up the ski slopes and heads behind the tram building where it hooks onto the Rim-Trail to the summit tower. The trail is blazed in yellow and is opened only when ski season is closed.